This system always holds five ETFs (equity-, fixed income-, leveraged equity-, short equity-, and Gold-ETFs) selected according to stock market climate and rank. Typically, during good-equity markets it holds equity-ETFs and/or leveraged-equity ETFs, and during bad-markets fixed income-ETFs and/or short equity-ETFs. Also at times it can hold three gold-ETFs with other ETFs. A one factor ranking system selects five ETFs from a preselected list of 33 ETFs. 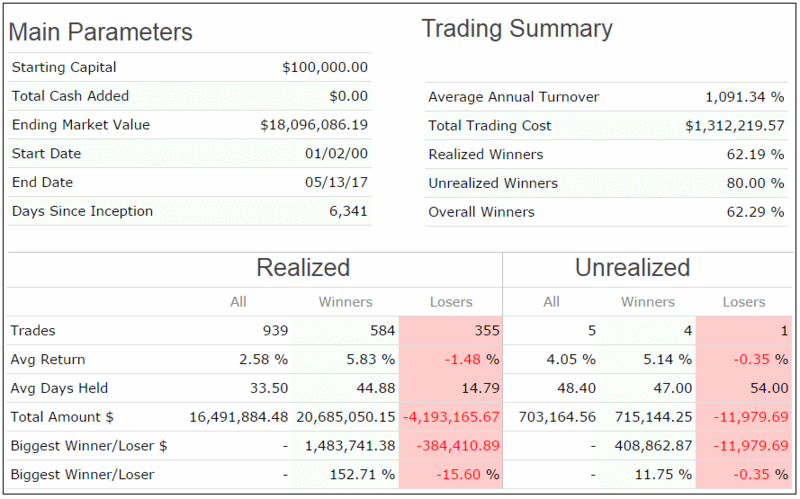 A simulation from 2000 to 2017 shows a 35% annualized return with a maximum drawdown of -13%. 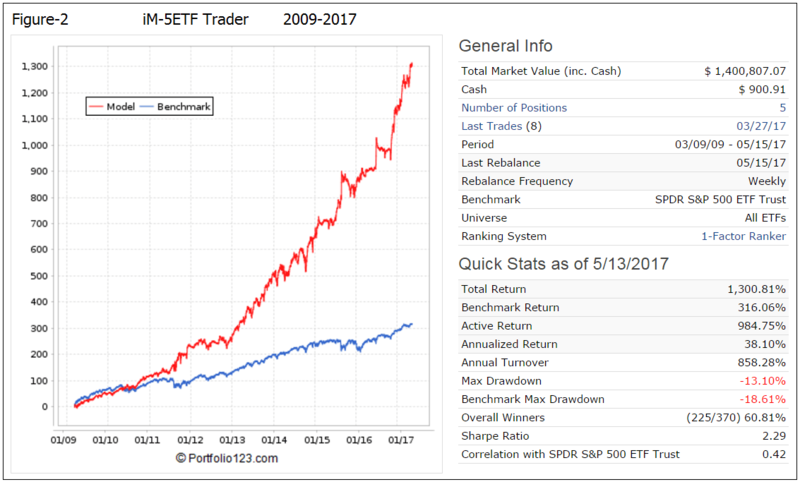 The model was backtested on the on-line simulation platform Portfolio 123 which also provides extended price data for ETFs prior to their inception dates calculated from their proxies. ETFs, other than P123 extended ETFs, were only considered for selection six months after their inception. Trading costs, including slippage, were assumed as 0.1% of the trade amounts using closing prices. The basic approach is to invest in five equity-ETFs during up-market periods and in five fixed-income-ETFs during down-market periods (Basic model). Market timing rules, listed further down, were applied to identify those periods. To improve return and Sharpe ratio, the model invests in three gold-ETFs when gold timing rules indicate this to be profitable and permitted by the ranking system. During those periods the model could have a 60% investment in gold-ETFs. The ranking system’s approach assumes trading ETFs, rather than investing for longer periods. The one factor system is based on the price changes over a short period. The idea being that ETFs which have experienced a decline over a short period will bounce back, reverting and doing better than ETFs which have not declined in this way. When testing this simple ranking system on the entire universe of all ETFs and CEFs traded on US markets one finds that, when rebalanced weekly, it produces a well-defined performance decline from higher to lower ranks, as shown in the diagram below. Also, one would expect that an efficient ranking system would produce higher returns for lower number of holdings in the model. This is indeed what happens when varying the number of holdings from two to ten in the ETF Trader Basic model. Trading costs were set to 0% so as not to affect the test. The model holding two ETFs produced an annualized return of 25.4%, which diminishes consistently as holdings were increased, all as shown in the table below. 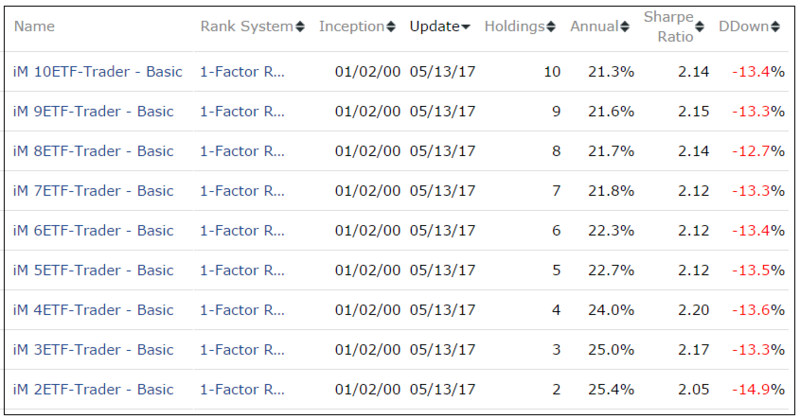 The model typically holds five ETFs from the list below, periodically selected by the ranking system and buy rules. and the current-year consensus S&P 500 EPS estimate. Down-markets are defined as periods when up-market conditions are absent. Definition of Gold-markets is based on the algorithm of the iM-Gold Timer. buy Equity-ETFs or Leveraged Equity-ETFs when up-market conditions exist. sell Fixed Income-ETFs, or Inverse-ETFs when up-market conditions exist. Performance from Jan-2000 to May-2017 is shown in Figure-1. The model showed an annualized return 34.9% with a -13.1% maximum drawdown. The simulated performance from Mar-9-2009 to May-2017 is shown in Figure-2. The start date for this period is the date when the S&P 500 was at its lowest level during the financial crisis recession. For the approximately 8-year backtest period the simulated annualized return was 38.1% with a maximum drawdown of -13.1%. The model significantly out-performed with lower drawdown the SPDR S&P 500 ETF (SPY) over this up-market period. Rolling 1-year returns with a 1 week offset are shown in Figure-3. There were 3 out of 855 samples with a small negative 1-year return of about -1.8% to 0.0%, with trading costs included. Calendar year returns are shown in Figure-4. There was never a year when the model had a negative return. Monthly return distribution is shown in Figure-5. 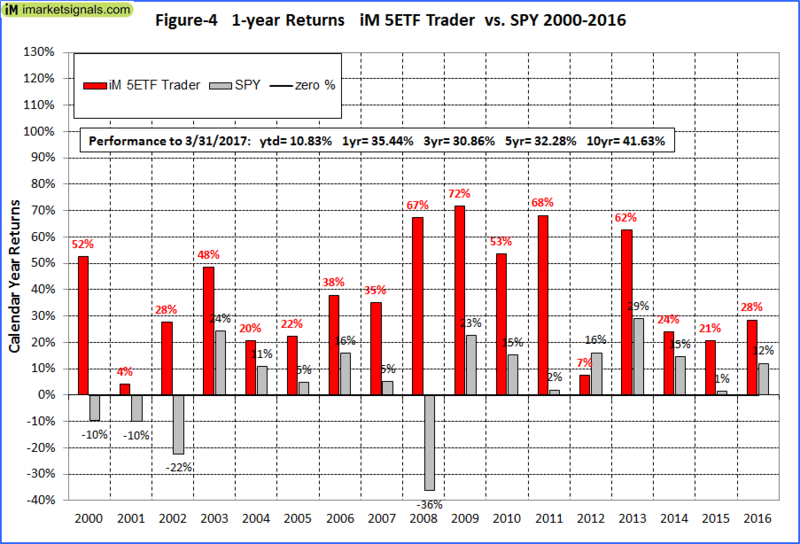 There were only 54 negative monthly returns out of 204, versus 84 for SPY. 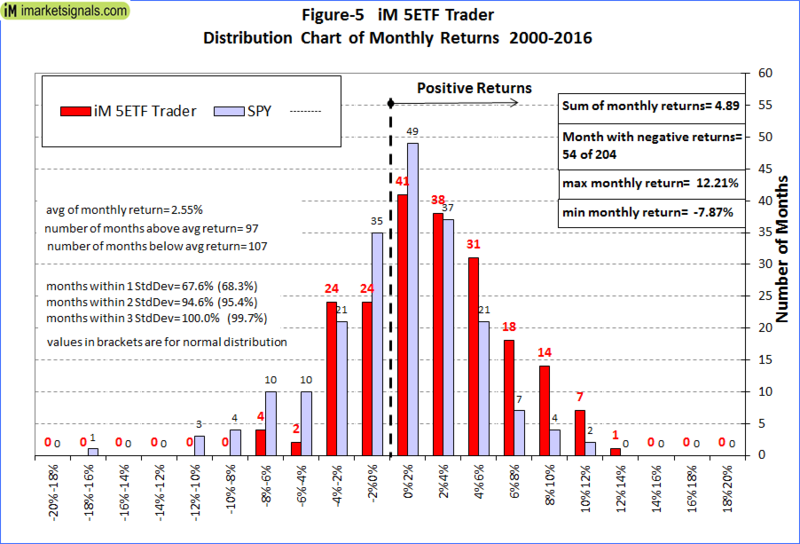 Also, all monthly returns are within three standard deviations away from the mean, indicating that performance is not due to a few outliers with extreme returns. This is a trading model with an average annual turnover of about 1,090% (11 x). The average holding period of a position was 33 days, 62% of all trades were winners, and the biggest loss of a trade was -15.6%, all as shown in the table below. Risk measurements are from Portfolio 123. Slippage including brokerage fees 0.1% of trade amounts was assumed in the backtest. Slippage is related to trade size, average volume traded, trade duration, daily volatility and shares outstanding. The slippage formula can be found in this article, and the calculation for the estimates of daily volatility is located here. As portfolio size increases the slippage also increases. Since this model trades in many liquid ETFs slippage should not exceed the assumed value until the total portfolio size becomes very large. This model could be of interest to investors willing to accept a fair amount of trading activity. See also “Best Practices” for ETF Trading. Note, that this is a trading model with 80% of all trades having a holding period of three weeks or less. There were 54 trades per year on average, and the maximum was 127 trades in 2015. On iMarketSignals we will report the performance of this model, with weekly trading signals normally provided on Sundays to Gold level members. On 5/15/2017 the model held: DDM, QLD, SSO, UWM and VOE. Note: All performance results are hypothetical and the result of backtesting over the period 2000 to 2017. Since performance is greatly dependent on market-timing rules, the future out-of-sample performance may be significantly less if those rules are not as effective as they were during the backtest period. No claim is made about future performance. Good one! Are the 5 ETF’s equal weighted at all times?? Yes, all equal weight. We will publish signals from May-21 onward. Please provide the return % and the drawdown % based on a monthly rebalance vs the weekly rebalance? Yes, I also would like to know how a monthly rebalance compares to this model’s weekly rebalance. Is it possible to provide some summary numbers to compare? This is a trading model which needs to be weekly rebalanced. regarding ETF best practices, do you generally advocate inputing transactions for execution at open of business on monday, or making trades later on monday morning? Vanguard’s ETF best practices advises never to trade in the first and last half hour of the day. Our models assume trading on the first trading day of the week, and the 5ETF Trader’s simulated returns are calculated from the closing prices assuming slippage of 0.1%. Can you elaborate a bit more on the ranking system ? Am I correct in understanding that it is based on mean reversion rather than momentum? It would be very helpful if you would construct a correlation table of the newer models you have developed, or possibly all the models in the performance table. I imagine there are quite a few of us trading multiple models with no real understanding of how they are potentially correlated. The ranking system is based on mean reversion, not on momentum. That is why the model trades frequently. We will soon publish a correlation table for all 12 ETF models for which trades are reported individually, or as part of a combo. Seems like another great system. Trying to understand the system. For the equity portion of the model it seems like the model would have a propensity to select a leveraged equity ETF making it extremely leveraged the majority of the time. Model currently 1.8 leveraged. Is this true or are there rules to ratchet down leverage with equity standard long choices? 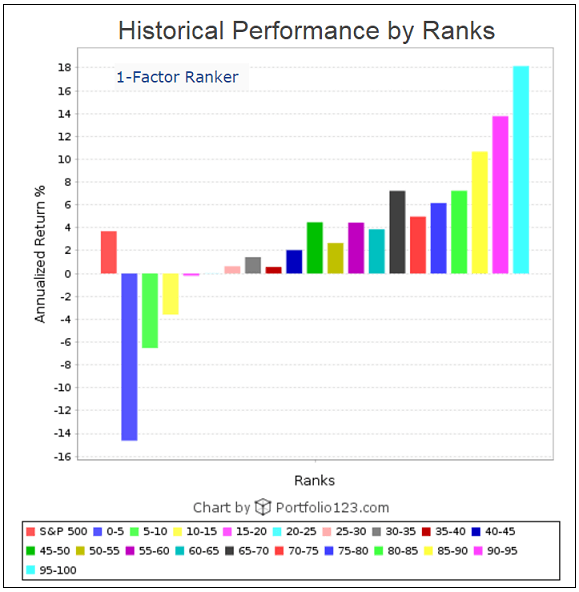 The model selects the highest ranked ETFs. EquityETFs or LevEquETFs during up-markets. It would appear that the LevEquETFs seem to be currently the highest ranked. There are no rules to ratchet down leverage with equity standard long choices, unless the ranking system selects them. Can you explain why the ranking system would prioritize a leveraged ETF over it’s underlying ETF? It must be something other than % movement away from the mean that is being utilized in this calculation as leveraged will always move further than their underlying. What am I missing? It is the percentage change which determines the rank, not the absolute difference. As a result the leveraged ETFs should typically be higher ranked. Georg, Will SPEPCY inconsistencies affect timing of this model? We use mainly the six-component composite market timer to determine up- and downmarket periods. SPEPCY has only a minor influence, so we do not expect any future inconsistencies of this indicator to affect this model. Another great system. Thanks for all you do for us Gold investors. During 2008, did the system hold SDS, IEF, etc. Is TLT NOT one of the ETFs the system can invest in? Appreciate any other insights into the inner working of the system you can provide in context of my question above. Adding TLT to the list of fixed income ETFs does not meaningful improve returns for this model. The simulation shows a marginal increase of 0.42% annualized return with TLT included, from 34.92% to 35.34%. Great stuff. Curious, did you model using leveraged Gold when the signals point to max Gold exposure? 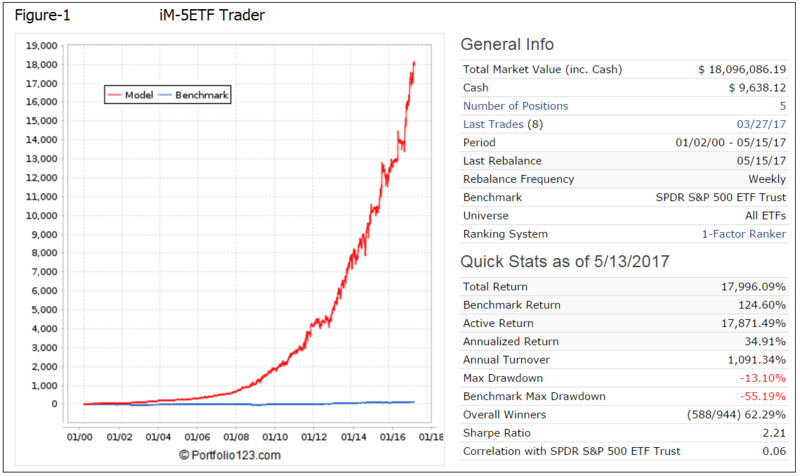 Tom, please see ETF selection list in the model description. The long leveraged gold ETFs are not old enough to be included in the backtest. Can you attach a history of signals over the backtest period? Georg, Wondering how fixed income only portfolio would perform? This model invests in fixed income only during down-market periods. Removing the possibility to invest in equity and gold ETFs would result that the model is in cash over long periods. Can you please point me to the section where the performance of this model is being reported? Can you please respond to my question above and let us know where to find these results now that we are trading The iM-5 ETF Trader live. Can you tell us what this would look like using only long leverage, no short leveraged ETF’s? Backtesting above is reported through 3/27/17 and the model was posted on May 15. But in the report of results states the inception date was 6/30/16 and gives a YTD out of sample result. This seems inconsistent? If not, could you explain how you are defining inception date and out of sample? Thanks. BTW, like nmtdoc above, I’d be interested in results with only long or only short ETFs leveraged. We have only recently prepared the documentation for this model which we posted in May, but were monitoring performance from the earlier date, 10/31/2016 as shown in the performance update. Where is the updated ytd performance for this strategy being posted? It is posted in the Model Performance Tables. Is it possible to have performance expressed as CAGR rather than Annualized Return? Portfolio 123 Annualized Return is the same as CAGR. What kind of return / risk will I get if I combine this model with “The iM-Minimum Drawdown Combo”? Would you mind running this so that when the model shows down market conditions exist, the model simply goes to cash (or SHY). Essentially a Long, Lvg Long, Gold scenario. We don’t advise to run this model without the fixed income ETFs. Curious about a model to protect from black swan events. Would you consider a fixed income only model primarily based on your ranking system that is continuously in a fixed income vehicle not cash? Then maybe fixed income gold? Could you run this without Gold-Stock Bond, allocating 1/3 to each of the remaining 3 strategies? Where is the correlation table? I know thwere is one, but can’t for the life of me find it:). Wondering if this model could be improved with a 5% loss sell stop? I am slightly confused. You show the trades for this study from 2000 thru 2017 and there seem to be fairly frequent trades. But now there has not been one trade since March 2017? Also, it does not seem to be a mean reverting system, but rather a momentum based system that has stayed with the momentum of equities. I am very interested in implementing this system even though it will mean frequent trading. I notice that in the backtest there were about 50 trades per year, but there have been no trades since 3/27/17. Has there been a change in the system that would now require fewer trades? There were no changes made to the model’s algorithm. This model did not trade because market conditions did not change according to the built-in market timer. How does the following combo perform? This is a highly leveraged portfolio which can only lead to major losses. You advocated the SSO-SDS in a 2013 article called iM Best (SSO-SDS): Beating the Market with leveraged ETF’s and you recently back-tested the SSO-UST and said it only drew down 21%. I am not investing 100% of my portfolio to this strategy, so I was hoping you could back test it for me with the 4 models listed 25% each? Could one not, in the case of a very large portfolio, buy an appropriate number of out-of-the-money put option contracts and simultaneously sell, or write, an equal number of out-of-the-money call option contracts, with the same expiration date, essentially locking in profits? One could then close the very large equity position and make up the slippage losses with the options collar’s gains. I notice that there are no international equities available in this model. Do you think that there is a risk that international equities may significantly outperform U S equities at some point in the future? I also have the same question. Many analysts speak of risks of high inflation or stagflation in the future, it would make a lot of sense to have access to international equities in some tactical strategies. Why did you choose to hold 5 ETFs then? Is this a risk management measure? Yes, it was felt that holding 5 ETFs would be less risky than holding only two highly leveraged ETFs. In light of the current drawdown in this model, could you run the backtest again, updated to the end of 2018? I’d like to see this drawdown in the context of the entire history. I understand why the model remains in an up-market stance. We want to avoid curve-fitting, but is there any modification you would make to this model? I’d appreciate any comments. Yes, thank you for pointing this out. Should be IGSB, not IGSP. now the website shows IGSP…. I know I’m posting this on 3 different models, but can you please give me an updated Sortino ratio from present through the entire back-test period? Thanks!